Have you ever wanted to try a new crochet technique and been intimidated by the project patterns? How about starting with something smaller, something still useful but small enough to just dip your toe into a new technique? If you’ve been itching to try the crochet stitch but have looked in vain for a smaller project to begin with, you’ve come to the right place. 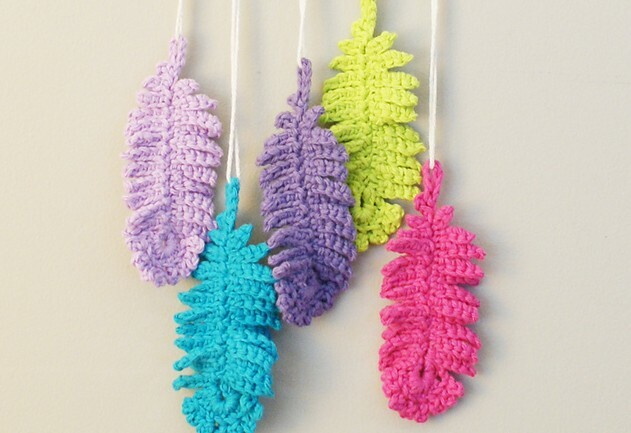 With these Crochet Feathers, you can try out the stitch without having to commit to a lot of yarn or time. There are a variety of patterns for this project, and we’ve collected video, photo and written tutorials to help you perfect those pretty feathers. Whether you’re going to make one for a bookmark or keychain, or string a bunch together for a garland, or make an entire tail of feathers for a wall hanging, we’ve got you covered. If you want to watch a video tutorial before you begin, look no further then Craft Addict’s YouTube video on crocheting reversible feathers. The video is in Spanish with English subtitles. You’ll need a crochet hook, yarn, scissors, and a tapestry needle for the project. If you’d rather look at photos and read a tutorial, Poppy & Bliss have an in-depth tutorial and pattern to make your own feathers, along with several ideas on how to use them, including using them to adorn gifts, making them into jewelry or scarves, adding them to blankets, pillows, and bags, attaching them to greeting cards, and framing one or a collection. If you prefer to purchase a pattern that utilizes the feathers in a project, Erin Black has a PDF pattern available for sale on Ravelry called the Dreaming of Feathers Wall Hanging, which can be altered to create a child’s mobile. To make the feathers, you will need to know the following beginner crochet stitches: chain (ch), stitch (st), yarn over (yo), slip stitch (sl st) and loops (lp/s). In addition to those simple stitches, you will need to learn both the Make 1 – Top Bar stitch (M1tb) and the Simple Stitch (Tss). Poppy & Bliss included a short photo and written tutorial for those who are not familiar with these stitches. The M1tb might be a little trickier than the first example, but with some practice it will get easier as the pattern continues. After you’ve made a few feathers, you’ll fly through the pattern with ease and you’ll have enough feathers to fluff out a pillow! There are plenty of other uses as well, such as a suitcase tag, a hair accessory, hot pads (stitch a few together), napkin rings, or even for cosplay purposes. You could even join several feathers together to make a lap blanket or a table runner. Whatever you decide to do and however you use these feathers, these beauties will be sure to catch peoples’ eyes. If you want to make your own Crochet Feathers, you can find the video tutorial at Crochet Addicts, the photo and written tutorial at Poppy & Bliss, and the Dreaming of Feathers Wall Hanging/Mobile is available for purchase on Ravelry.